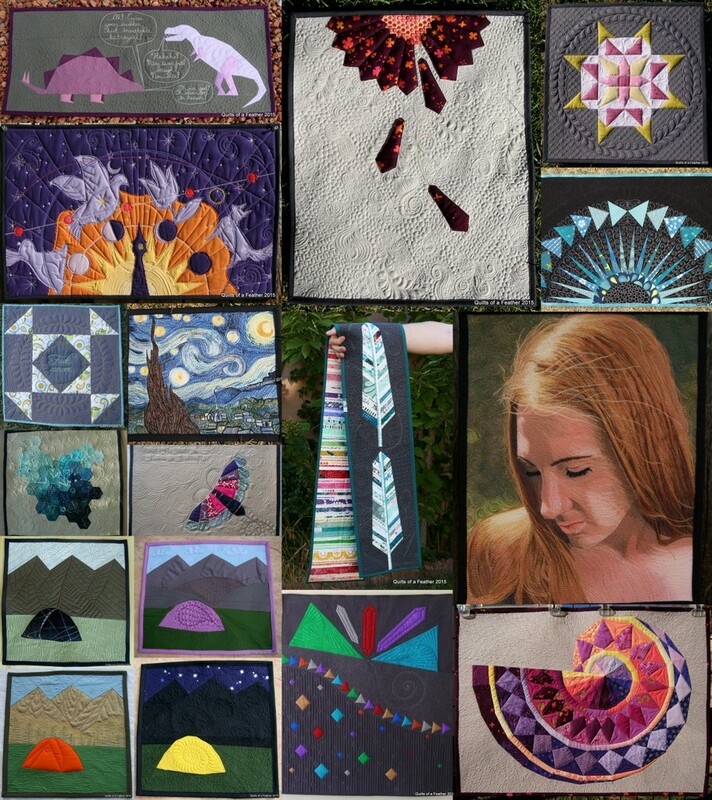 You can get the links to each of my quilts from my pinterest board. 17 Mini quilts, 9 for swaps or giveaways. It was another big year for mini quilts for me! Even though I have 17 pictured about, one of them was actually made in 2014, but I painted it this year and count it as a new finish for the year. 8 larger quilts: baby to queen sized (yes, 2 commissioned fancy TARDIS quilts). 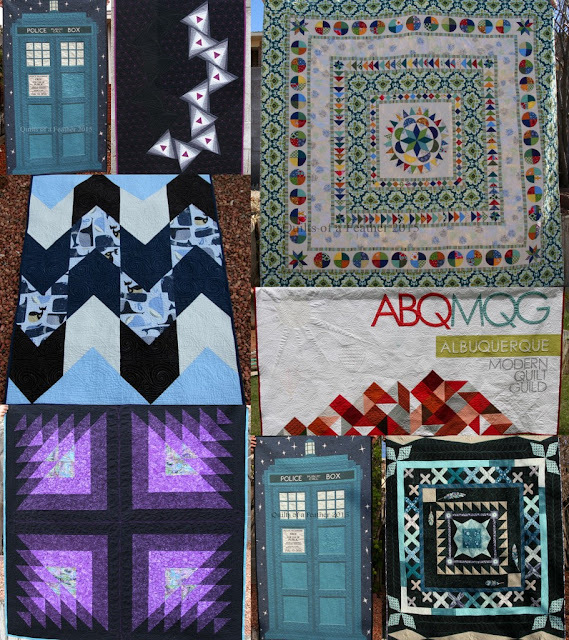 I made 1 queen sized quilt, 1 full sized quilt, 3 baby quilts and 2 TARDIS quilts (which are lap sized). I also quilted the ABQMQG banner, which was pieced by other women in the guild, but considering I spent 40 hours quilting and finishing it I'll count it here as a big finish. 16 Mini-mini quilts, most of them are quilted paisleys. This was also the year that the #miniminiquiltswap swept IG and I made fifteen 3-5" square quilts to swap with others through IG! I found my niche in creating really detailed FMQ paisleys, especially with variegated threads. They are so fun! Unfortunately I'm still waiting to receive 2 tiny quilts, even though it's been over 3 months! I also made a bunch of bags and clothes this year, but didn't keep up with photographing them very well. I should add that to my resolutions for next year: take better photos of all the clothes and bags I make! You've taken my breath away a lot this year Renee, with your beautiful quilting. 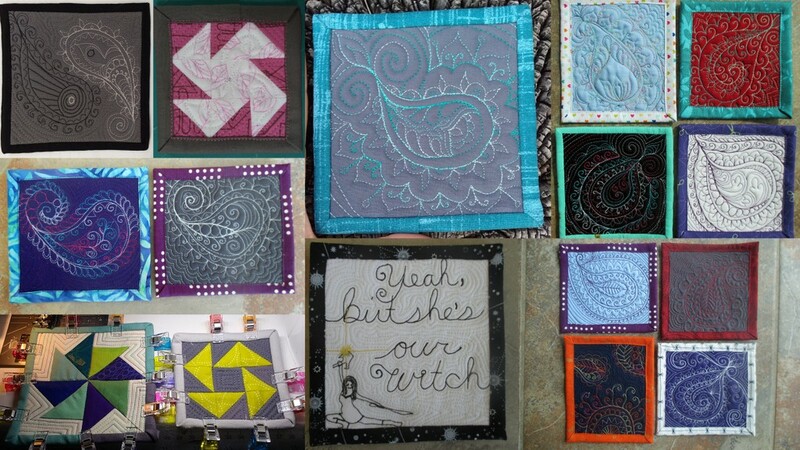 So many great projects and quilts and in one year! You single handedly turned my husband and I into Dr. Who fans, LOL. Gosh those Tardis quilts would do that to anyone! Such beautiful projects! I always love seeing your quilting. You made so many things YOU wanted to make! Yay you! I can't wait to see how your new pattern will come together. What a productive year you have had! Now you have reminded me about forgetting to photograph things. I have not posted the lovely mini mini Yvonne sent me - or the one I made her - on my blog. Whoops! Things fall through the cracks, eh? Wow, it looks amazing all presented in one post. Beautiful work!